Prior to any wedding ceremony, if there is no first look, I work with the bridal parties separately to capture some fun images. Depending on the personality of the group, these can end up being the most fun shots of the day! 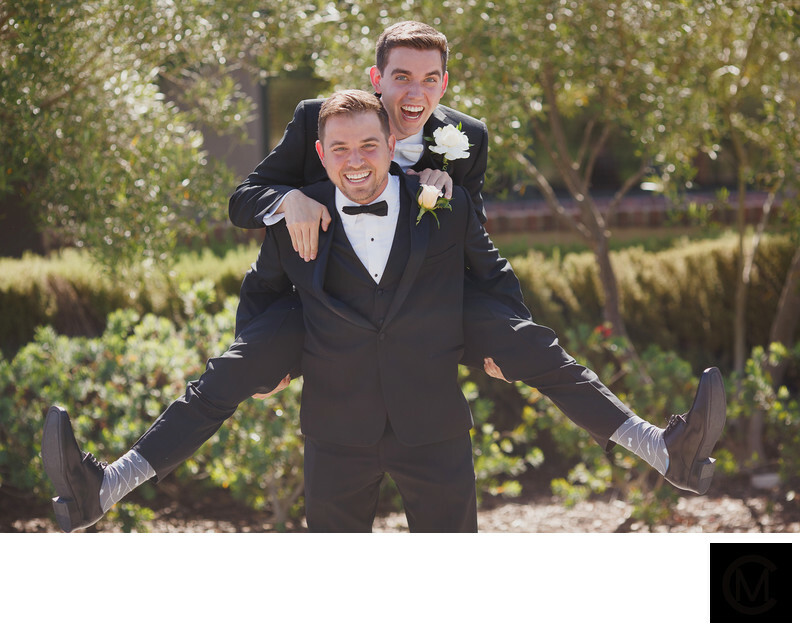 The groom here, Daniel, is pictured jumping on his best man's back (a surprise to the best man!). In my ten years of shooting weddings, Daniel has to be one of my favorite grooms because he was so personable both during the engagement session and on his + Kylie's wedding day. These images were taken at the Aliso Viejo Country Club in Orange County, California. This was a morning wedding which meant nearly all the images were taken in bright morning light. With this type of light, I work with the bridal party, or the couple, to find the best angle. The grounds at the Aliso Viejo Country Club are large, so there's lots of opportunity to create amazing images no matter the time of the day! Location: 33 Santa Barbara Dr, Aliso Viejo, CA 92656.